Wow. Barcelona really knows how to throw a party. 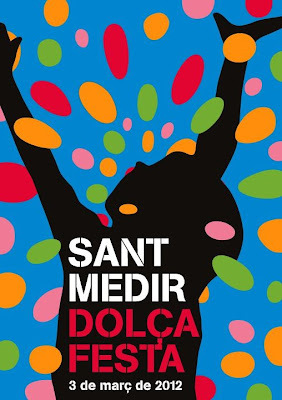 I keep getting surprised, there is so much going on all the time, so many fiestas and festivals and yesterday was the Sant Medir, la dolça festa. Walking down one of the streets in Gracia, a very nice area of Barcelona, there were loads and loads of children with bags and umbrellas. (It was not raining) I heard music and drums in the distance so I joined in and waited for the parade coming down the street, horses, horse-drawn carriages, trucks… with people throwing out … CANDY! Hence the umbrellas: something to catch flying candy in, and the bags to fill them up with candy. How fun!! 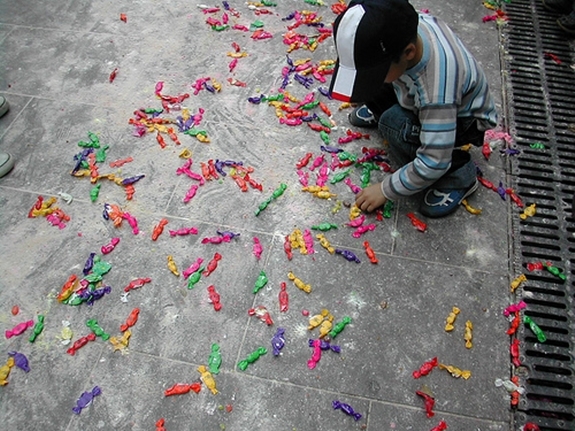 They call it pluja de caramels, candy-rain! The origins of this dates back to 1830, when a baker who was very sick prayed to the Saint Medir to get well. He promised that if he got well, he would say his thanks to the shrine of Sant Medir every year. To make his promise public, he went out in the streets on 3. 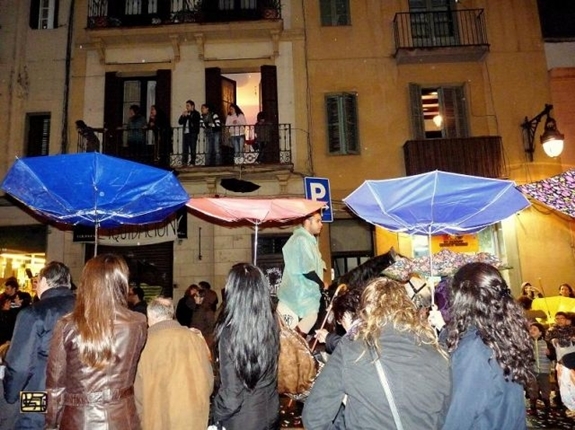 March (Día de Sant Medir) playing a drum and handing out sweets. Shortly he felt better and every year since, accompanied with an increasing number of relatives and neighbors he kept his word with the drums and the candy and a tradition started to form and grow. 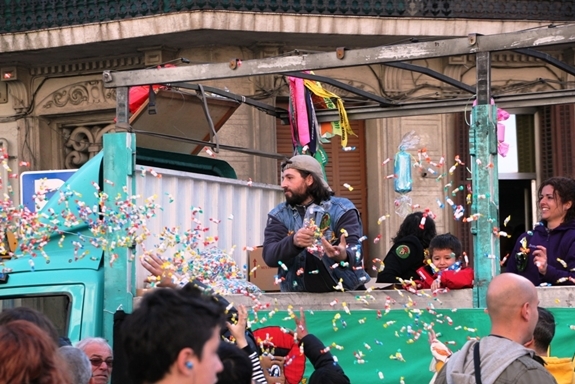 Each year at March 3rd, Gracia wakes up to drumming, whistles, parades, horses and candy. There are about 30 different groups participating with their own different flags and banners and the different carriages are decorated with all kinds of items, flowers, ribbons, and flags. The kids were going crazy trying to catch and collect as much candy as possible. People were even hanging out of windows to catch candy!! In the evening, there was another go! New parade, more candy. Akkurat nå sitter jeg og jobber for harde livet med zumba musikk og klekker ut koreografi som jeg har deadline på til tirsd...egentlig må jeg bli ferdig i dag, for i morgen er det jobb, så rett på musikkskolen og er ikke hjemme før 20-21 og tirsdag jobber har jeg jeg jobb fra 8 og utover til koreografien skal brukes kl 18.
bare jeg kommer meg gjennom 12 timers jobb på tirsdag, så kommer det mail fra meg også. Kjære Mette, jeg har ikke forventet et ord mens du har vært i Kenya :) Men siden jeg er fascinert av det landet har jeg storkost meg med bilder og historier derfra, og gleder meg til mer. Lykke til med overgangen tilbake til virkeligheten..
Haha, det er en del streiker her også, men denne paraden var litt mer glad og lystig!! Parades and candy? Yes please! Yup, the website of Barcelona city council. It offers you all the information you'll need and more. Thank you for the tip, will for sure check it out! Cool post, I had no idea that was going on this weekend! 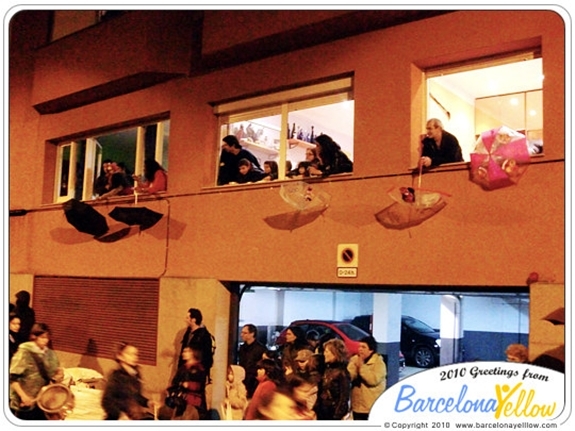 I use the Barcelona Cultural website to find out about festivals because it has a special section for them (http://barcelonacultura.bcn.cat/festes-i-tradicions). The Butxaca is also good for finding stuff to do every day (http://www.butxaca.com/), especially free stuff! That looks like so much fun. And how cool that one man could start up such a long standing tradition. I was thinking the exact same thing. Impressing how traditions are built here and kept alive, and how much fun they've got going, and how all generations are present always! I probably need to come spend a year in Barcelona to experience all these different festivals and entertainment. How lucky you are!